We get a fair amount of wildlife as regular visitors in our garden. We see lots of bulbuls and other birds, squirrels, bats, even one small snake that wriggled into the innards of my motorbike and hasn’t been seen since. 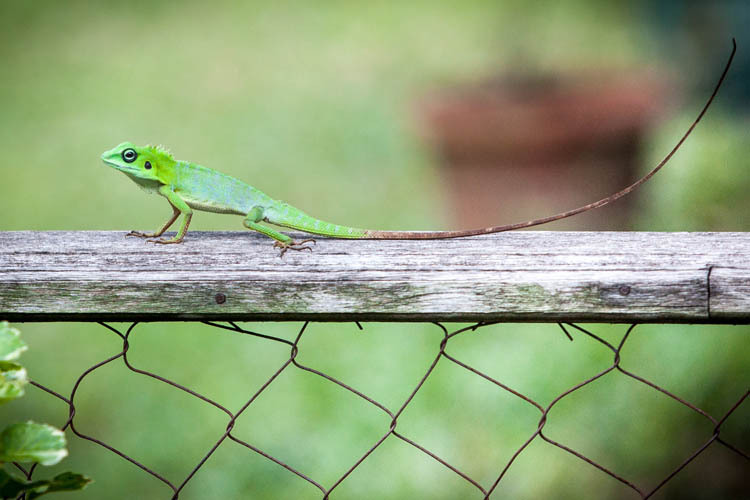 But yesterday was the first time we’ve had a Green Crested Lizard (Bronchocela cristatella) come to visit. He ran rapidly along the railing of the side fence, before stopping to pose for photos, and then scampering up a tree. He (and apparently it was a ‘he’ – only males have the crest) was very attractive. 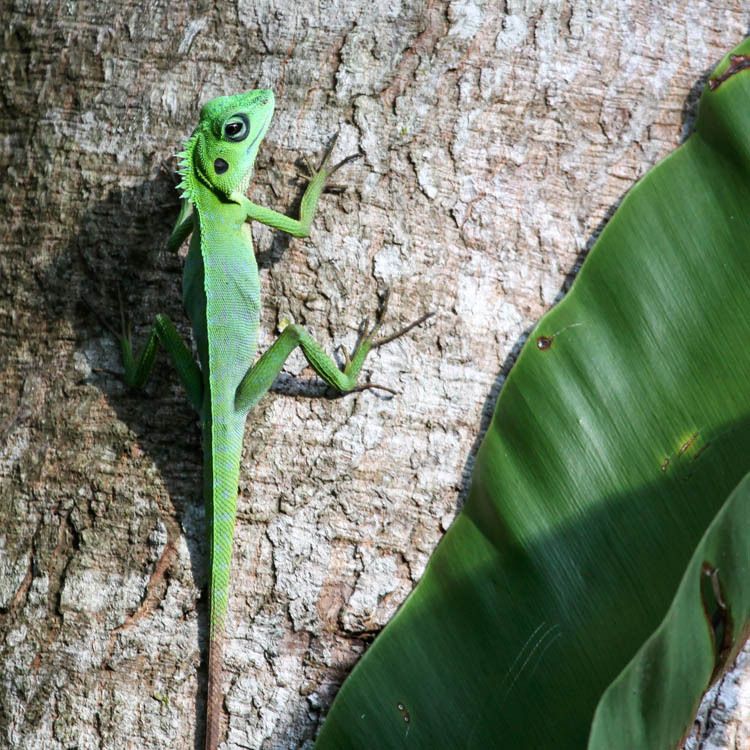 Bright green head and body, big eyes, and a long long delicate brown tail, which made up three-quarters of his 60cm length. 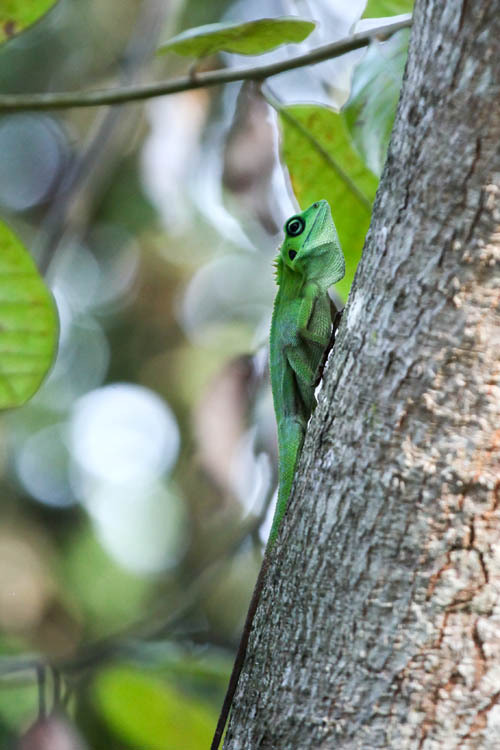 Although it’s the first time we’ve seen one, the Green Crested Lizard is in fact common, and can be found across Southeast Asia, from southern Burma right through to New Guinea. They mostly eat insects, and in turn they get eaten by snakes and some of the larger varieties of birds. He is a lizard (Ind: kadal), not a chameleon (Ind:bunglon, but he can change colour. When stressed, he will turn brown. Our visitor must have been feeling relaxed, because he remained a brilliant green colour during his visit. 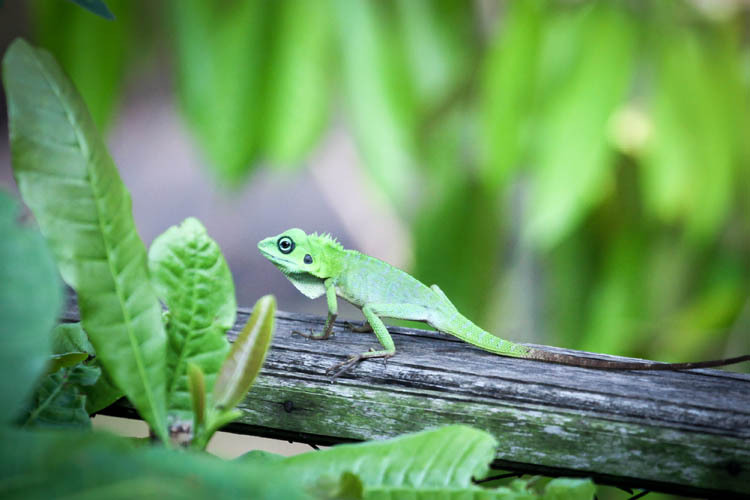 This entry was posted in Indonesia, Wildlife and tagged Bronchocela cristatella, Central Kalimantan, Green crested lizard, Kalimantan Tengah, reptiles. Bookmark the permalink.